CMP hospital under counter Refrigerators are high quality stainless steel refrigeration units designed for the storage and functional requirements of the hospital and emergency room environment and have evolved into the industry standard for this application. Connections required are: ½” (13 mm) hot water, ½” (13 mm) cold water, and 1½” (38 mm) waste. Standard electrical requirements: with hot plates-110/208 vac or 120/240 vac, single-phase, 60 Hz, 20 amperes, three-wire; without hot plates-same vac, but single-phase, 60 Hz, 10 amperes. All servicing is performed from the front of the unit. 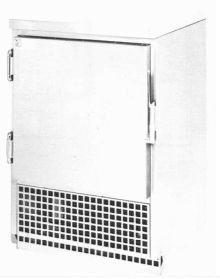 CMP Model 24 Under-Counter Refrigerator or Freezer is constructed of type 304 stainless steel with No. 4 finish. Welding is done by the Heliarc process. All exposed welding is ground and polished to match the No. 4 finish. The entire unit bears the Underwriters Laboratories, Inc. listing seal. CMP Model 24 Under-Counter Refrigerator is completely insulated with 2” thick fiberglass insulation. The unit also contains two chrome-plated wire shelves that are adjustable on ½ “ centers to optimum height. The door seal is made of long-life, extruded vinyl latex. Also, bakelite breaker strips are installed where interior surfaces join together. Continuous perimeter heating that is concealed behind the front mullion eliminates condensation. CMP Model 24 Under-Counter Refrigerator is equipped with 1/5 hp, hermetically sealed, air-cooled condensing unit with manual defrost control. Compressors come with a 5-year warranty. The refrigerator’s capacity is 5.0 cu. ft. (141 liter), has automatic self-defrosting, and is of double-wall construction and is fully insulated with urethane foam-in-place insulation.